"There is nothing you can see that is not a flower." 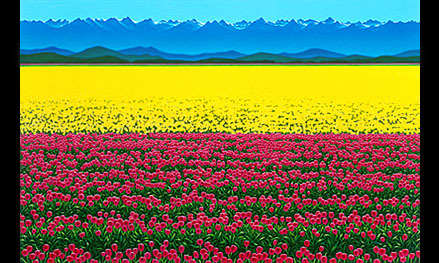 This painting depicts a field of tulips during the Skagit Valley Tulip Festival, held annually in the Pacific Northwest in and around the towns of La Conner and Mount Vernon in Washington State. The Cascade Range can be seen in the background of the painting. Cascadia is one of the most colorfully glazed works Alex has ever painted.